Jacqueline Ackerman is the assistant director for research and partnerships at the Women’s Philanthropy Institute. In this post, she details new research about gender and #GivingTuesday, and why fundraisers should focus on women donors. A new study by the Women’s Philanthropy Institute (WPI), Gender Differences in #GivingTuesday Participation, found that women make up the majority of donors on #GivingTuesday. While #GivingTuesday 2017 has come and gone, this study is important because now is the time for organizations to evaluate their #GivingTuesday performance this year and consider adjustments to their 2018 strategy. How did your organization fare on #GivingTuesday? 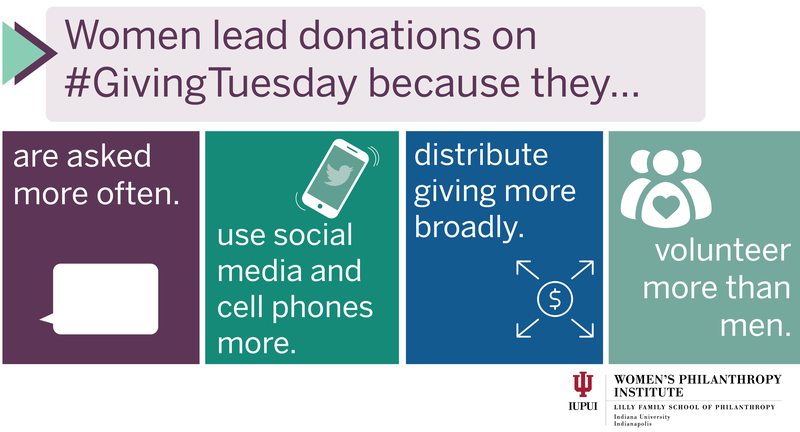 If your nonprofit didn’t see a sharp increase in giving on #GivingTuesday, why not? Consider whether your fundraising strategy—on #GivingTuesday and overall—appeals to both men and women. Our new report suggests that women and men use technology differently to give to the causes that matter to them. Nonprofits should consider these gender differences as they craft their fundraising strategies. #GivingTuesday has experienced tremendous growth over the last five years, and we expect it will continue to grow in the future. Given women’s higher participation levels in #GivingTuesday, nonprofits must understand gender differences in giving habits and how to maximize giving by both men and women. The research was completed with funding from the Bill & Melinda Gates Foundation. The findings and conclusions in the research, and the views expressed in this blog post, are those of the authors and do not necessarily reflect official positions or policies of the Bill & Melinda Gates Foundation.